It is not the prettiest but SO GOOD. Yay! Finally, there's fresh local produce again. Makes me so happy. And kicks canning season into gear too. Wash your Mason jars in hot soapy water. Rinse well. Wash and chop your rhubarb and put it in and the vinegar in another pot on medium heat. Throw in the sugar. Admire it. Add the salt, curry powder and Tapatio or whatever peppery element you're using. Stir it well. 6. It'll get really watery as the rhubarb releases its moisture. Cook it down. 7. You might want to take a little taste to check for spice level. Add another shake or two of hot sauce if the spirit moves you. Cook it down some more, stirring occasionally. I think this part was at least 30 minutes. 8. Rescue your Mason jars from the boiling water at some point while your rhubarb cooks. You can shut off the burner under your canning pot. It'll stay hot for quite awhile. 9. When your chutney is nicely cooked down, ladle it into your nice clean hot jars. A wide mouth funnel makes this step much easier and neater. Leave about 1 cm headspace. Reserve any extra to enjoy as soon as it cools. 11. "Bubble" each jar with a skewer or chopstick to release any trapped air. Wipe each rim with a clean damp paper towel. Place the snap lid down and screw the ring on finger tip tight. 12. Put the jars into your water bath canner. Make sure there is at least an inch of water above the top of your jars. Put the pot lid on and return to the boil for 10 minutes. Don't start your timer until the water is boiling. 13. Remove jars from the canner (or let them sit in the canner until everything calms down). Listen to the music of the lids as they pop! pop! pop! sealed. Now, relax and enjoy! This chutney is great as a spread on cream cheese and crackers, as a condiment with pork or chicken, or as a chutney with a robust Indian dinner. 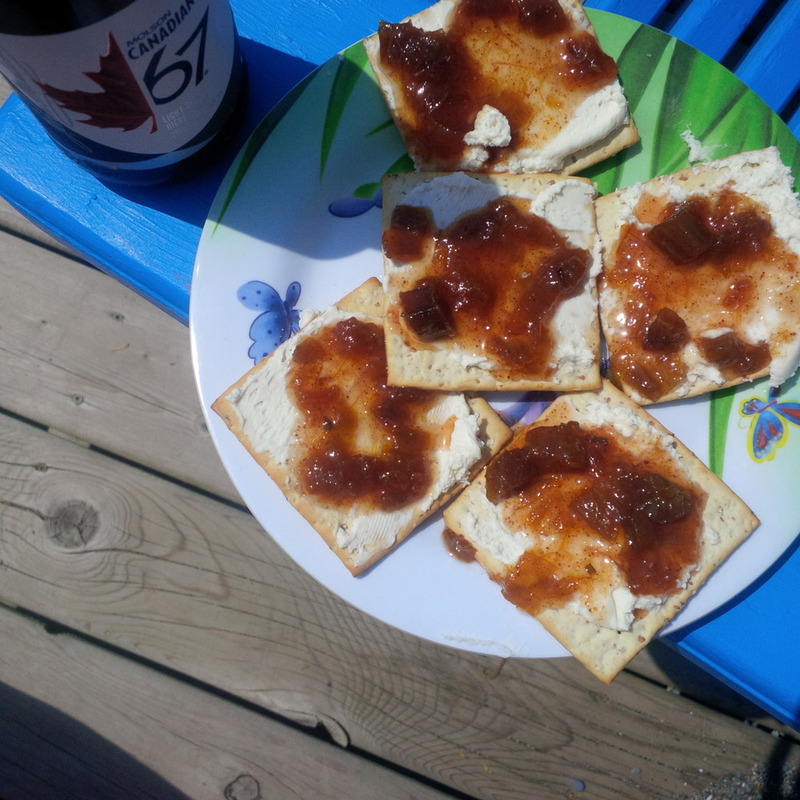 Stoned wheat thins (heh heh), chutney, and cream cheese and an icy cold 67 on a hot, sunny May 2-4 at the beach. Heaven.